This we ek, Mark Rylance spoke about the trap that many actors, including himself, fall into when acting Shakespeare. However, saying the lines quicker is not an excuse for under preparing and not understanding the text. If anything, as Audition Doctor students can attest, it requires a commitment to an even deeper comprehension of the play as well as heightened verbal dexterity. 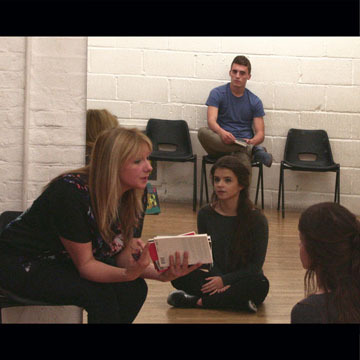 Students have found that regular preparation at Audition Doctor gives them structure and they are able to see results quicker under Tilly’s guidance. Audition Doctor sessions take a lot of the pain out of the homework through targeting specific aspects of the speech students find difficult and practically solving them in the doing of it. Through this kind of experimentation, students find that they end up discovering their own version of the character. Making a Shakespeare part your own is what Audition Doctor pushes each student to do. Tilly also makes certain that they enter every audition with confidence – both from knowing that they have an original take on a role and also from being ready to make bold choices and not being too precious. The readiness to abandon their performance altogether in favour of trying something new if the panel asks is a quality that Audition Doctor students possess. Audition Doctor gives students this understanding and Akinade also stated that in auditions, “you’ve got to be the better you”, which is absolutely what Audition Doctor enables each one of her students to be.